Today’s card is for my sister in law. Kelly is my hubby’s sister. I remember the first time I met her very clearly, she wasn’t a huge fan of me. Later, we were hanging out and she told me she was so glad that Kevin found a nice country girl. We’ve been buddies since. She was in our wedding and I couldn’t have gotten luckier to have this girl as my sister in law. Now let’s discuss her devil dog. Her dog is straight from satans lair. Ok, maybe he’s not that bad, but I am going to let you judge. He hates me. AND NO DOGS hate me. Dogs love me, I am a dog magnet. Anyway, even though I don’t have a bond with Ollie (because he’s crazy) Kelly loves him endlessly. 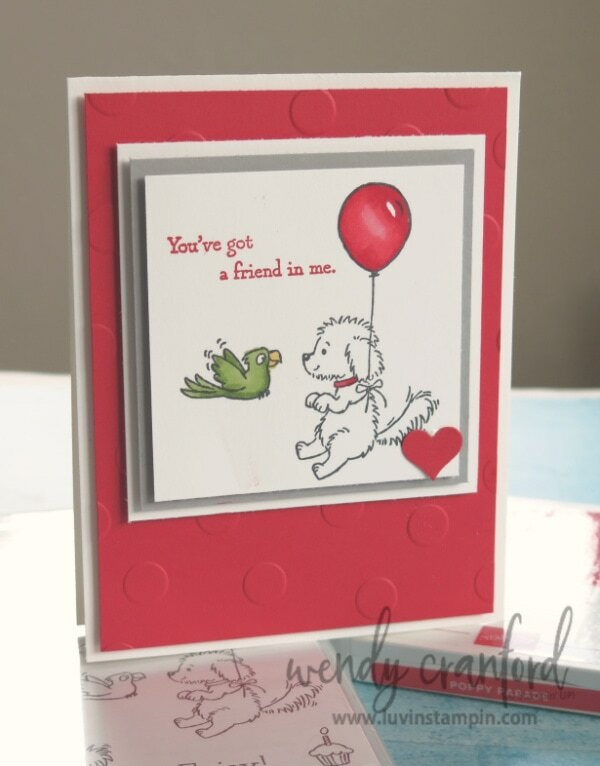 So I used Bella & Friends to create this adorable card. I love that stamp set. Cute card. What is the name of the eraser you used to fix your boo boo? So does Ollie bite-looks like he doesn’t like anyone except Kelly. Oh, I loved your card and how you fixed the ink smear – perfect!!!! I do find with the stamp pads that is a problem with getting ink on my fingers so I always check them once I have opened up one of those pads. I love the Bella stamp what an adorable dog! My cousin and I were just talking about my 2 former cats – one that she calls the devil and the other 666 (her cat is Ollie too). Then I see your blog and what a coincidence. Both were crazy like Kelly’s dog and unfortunately her sister also had a crazy dog. You are so funny I keep laughing about the older man in church , I couldn’t stop laughing it took me awhile to calm down . I will probably laugh out loud all day and my friends will wonder what in the world is wrong with her. I tell you keep those stories coming, you would be so much fun to hang out with and I’m not that young, but I’ll keep smiling about this one.